FAQs – Can I use your images for free? I often get requests asking if I will allow a person or a company to use my images for free. In return they will give me picture credit and possibly a link back to my website. I got one such request a couple of months ago via Flickr. For educational purposes I’m going to share the experience. I imagine the content in this blog post will be painfully familiar to other photographers, but more importantly it may be enlightening to others. 2. moosin.net | Martial arts online website. We will keep your credit of you in each article we use your picture and link it with your flickr profile. I didn’t reply to this email. I gave it a quick glance, saw it was a request to use a whole series of my images for free, and ignored it. I simply don’t have time to write a polite refusal to everyone who asks to use my work for free. On May 19th someone who follows the Karate Masters Portrait Project, pointed out on Facebook that one of my images was being used on the Moosin website and asked me if they had permission. I checked. There was an image of karate master Narihiro Shinjo on their website above the title “The big lie in Martial Arts.” There was a link to TRAVEL 67, but they had also spent time removing the watermark from the bottom left corner and for some reason mirroring part of the image on the left side. The article and photo had already received 641 shares on Facebook, was also shown linked to on the Taekwondo Federation website. Appropriately, considering their banner, it had gone “viral” before I knew anything about it. I immediately contacted Wim Demeere the author of the piece asking what was going on. I’m glad my email was polite, because it quickly became clear it was not his fault at all. He’d been asked by Moosin / ITF if they could republish some of his articles about martial arts. He’d said yes, and his writing was used with his permission. He had not control over image selection or layout. I’m sorry I didn’t reply to the email immediately but I get numerous requests to use my images for free and do not have time to reply to them all. It seems that having not received my permission which you requested in this email, the watermarks on my image(s) were removed, and the image(s) were used online. As a professional photographer I don’t work for free or just photo credit. My images are available for licensing, and this helps me to make a living. My images that are currently being used on your websites need to be removed or we can come to a licensing agreement. I am sure that the International Taekwon-Do Federation had no intention of breaking copyright law, and that this is just a simple oversight. The magazine is the joined project between moosin.com and itfline.org all staff works there was paid by International Taekwon-Do Federation under Korean government contract or volunteer works. We already removed the picture in the article that you mentioned temporarily until we can clarify this case with you. If you not allow us to use the picture, we will remove all the pictures that was using from your account in our networks (social networks and websites) as soon as I received your confirmation. Again I am really sorry for this situation but I hope you understand we are not intentional violate the copyright. The purpose of building Moosin.net magazine is to promote martial arts and helping our Taekwon-Do organisation expand our connection with other martial arts, not for profit purpose. Thanks for getting back in touch quickly. There still seems to be some confusion so I’d like to make things clear. I’ve broken up your reply in chunks to answer things as they come up. The fact that your magazine is non-profit does not affect my choice as to whether I charge for the licensing of images. If a student came to a Taekwondo-dojo and said they wanted free lessons, because they were not intending to make a profit from Taekwondo you would politely refuse and explain they have to pay the class fee as these fees pay for the instructors time, the rent of the dojo, electricity etc. If the magazine is a project by the ITF and staff are paid,I presume you also have to pay for printing costs, website hosting fees etc. If you wish to use imagery for your magazine this should be budgeted into the costs of running the business. We have no intention of breaking the copyright law. Our staff was using the picture under the creative common from flickr. Creative Commons agreements only apply to a portion of the images on Flickr. On all my images on Flickr it states Copyright All Rights Reserved. If you check the metadata for the file it also states Copyright All Rights Reserved. I notice that you are using numerous other images from Flickr taken by other photographers. Many of these are also Copyright All Rights Reserved. You can’t remove a photographer’s watermark without their permission, it is not your photograph to edit as you wish. The purpose of building Moosin.net magazine is to promote martial arts and helping our Taekwon-Do organisation expand our connection with other martial arts, not for profit purpose. 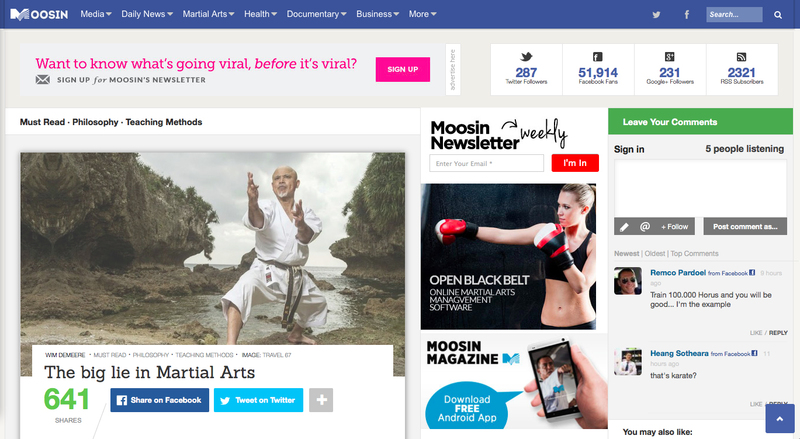 “Moosin is the leading sports management and marketing company focused on MMA and extreme sports athletes.” If this company is a leader in marketing it must be aware of copyright issues when using imagery. You wish to expand your organization, that’s great. It will mean you have more members and have more memberships fee, more certification fees, more seminar fees, and more competition fees. The fact that your magazine doesn’t produce a profit does not affect whether you should expect to use images for free. I provide the text and images to several in-flight magazines. Their magazines are also given away free to customers. The production of the their magazine does not produce a profit. They pay to use my writing and images. I provide a service, they pay for the service. If you would like to use my images on your website please tell me which image you would like to use, where you’d like to use them, and for how long you’d like to use them. I will then make a determination if I can license the image as I may have to check with the karate master, before telling you a fee. Of course you should remove all the pictures that were taken from my account, because you currently do not have permission to use any of them on your social networks and websites. As a final note, I would suggest that you do a comprehensive check through all imagery you are using on social networks and websites to determine if you have permission to use them. There is no actually cost of running Moosin Magazine and we have no budget for this magazine actually… We keep the whole information and data online since we don’t have budget for creating magazine and publish them. Initial, all articles were published under our ITF website athttp://itfline.org. But because of political issue between different organisations and some writers are affair of working with us, we created the online magazine so more people can involve. There are quite many photographers with copyright all reserved pictures are being used in moosin.net, but we usually contacted them first for permission of using. We refer to search by using the creative common pictures. If as you said your picture is not the creative common license, I believe this is clearly our mistakes in the staff and we will take responsibility for it. In the conclusion, I will forward your email to all the staffs who responsible for the Moosin Magazine and manage the social account to notice them take out your pictures from our accounts. If there are any of your pictures are being used without your permission, please let me know and I will act quickly as possible. I am really appreciated for your detail email. But in our ITF, we don’t want to consider the Moosin Magazine as profit making tool, our plan just want to use it to promote martial arts. All staff in ITF who responsible for Moosin Magazine is working extra hours of their time without paying to take care for Moosin. Their salary is only cover the ITF works. So we really don’t have budget for the image licensing. However, if in the future, we are planing to expand the magazine, we will contact you for your picture. I haven’t replied to them any further. I don’t have time to keep writing long emails to people when I should be investing my time elsewhere. Maybe when I get requests from organizations to use my images for free I should have a standard reply ready to send. No you do not have permission to use my image for free. Licensing is available. This enables me to make a living. Please contact me for more information on how I can help your company. If your organization doesn’t have a budget for image licensing then there are some images, mine included, you simply won’t be able to use. If you decide to use copyright images without licensing, it would be advisable to start budgeting for legal costs. Lay it all out there, right from the get-go. Make sure it stands up in court. Love the last line if the standard reply email. Might put that in mine. I commend you on maintaining your professionalism. Can I still dive with you for free? You handled this case very well I think! Sadly, this quite typical, that copyright infringements are by people who use your photos without permission, just because they don’t like to spend any money on your images!!! So stealing is OK, if you’re poor, but nor when you’re wealthy?! Not the first time, not the last time, sadly! By the way, are you getting the new 645?! Yes I’ll be getting the 645Z when it comes out next month. I’ll put up a blog post soon with more information. Next PostTousosai festival at Touzan Shrine. Arita, Saga Prefecture, Japan.